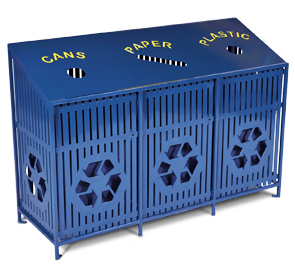 These recycling stations are well suited for the outdoors with durable solid steel construction and the finest powder-coated finish available in an array of colors shown below. This is a smart, efficient way to do your part for the environment and save money. Convenient three-stream recycling stations ensure trash is properly disposed of all in one centralized location. Easily recognizable slanted slot for paper and circular openings for cans and plastic. Laser cut word labels make it easy to use. Comes standard with three removable 38 gallon rigid plastic liners. Three Removable Rigid Plastic Liners. Available in an Variety of Colors.